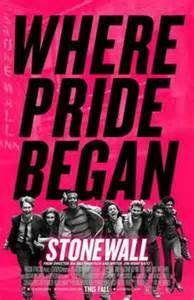 While “Stonewall” is not an ‘award winning’ film it is certainly a MUST SEE film for an audience of young LGBT people and people who have heard of Stonewall, don’t know what it is, and knows very little, if anything, about what was a major point of reference in the fight for equal rights and for older LGBT folks who might need a refresher course in their history and who helped them to accept themselves. If half of the millions of people who claim to have been at the Stonewall bar on that Saturday evening of June 28, 1969, came to see this movie it would be a smash hit but neither will happen because of many prejudices of the nongay people and, now as then, gay people would rather go to a bar than support a film they should be seeing. 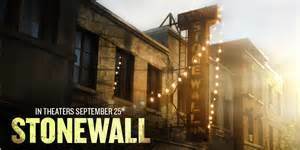 Yes “Stonewall” is ’Hollywoodized’ by framing the story around a good and virginal looking, young man who is disowned by his family when caught ‘servicing’ a jock and he leaves to go to New York, somehow winds up in the Village among a group of very diversified Latin, Black, transgender, drag queens and lesbian people who make a living by selling themselves. They ‘lived’ on Christopher street and went to the mob owned Stonewall bar which paid off the police who staged once a month raids. The fact that they arrested kids for not having identification or not wearing the right clothing and they would harass the clientele and, in some cases, beat them with nightsticks left them with no alternative as they couldn’t complain to the police, and so they would come back that night or the next. As silly as it may sound these disenfranchised kids, who would sleep 10-12 in a hotel room when one was available if they made enough money hustling, as were many gay people, felt an overwhelming sadness at the death of Judy Garland, who was seen as one of them, 6 days before the riot and many added this as a trigger to what happened that night. Though Jeremy Irvine is the center of the film as Danny, the boy from Indiana, it is Jonny Beauchamp as Ray/Ramona, a Puerto Rican who had been on the streets since he was 12 and falls in love with Danny which shows us the many sides of this occasional drag queen who does tricks to survive. Among Ray’s friends are Vladimir Alexis as Queen Kong, Caleb Landry Jones as Little Orphan Annie, Alex C. Nachi as Lee the hustler, Joanne Vannicola as a lesbian, whose back story would have made a more interesting film than the Danny story line, and Otoja Abit as Marshe P. Johnson, as a drag queen, who would become very influential in gay activism after the riots, with other possibly true to life characters who participated in the riot. Karl Glusman and Andrea Frankie as Danny’s parents, Joey King as his younger sister, Jonathan Rhys Meyers and Patrick Garrow representing an early gay rights group called The Mattachine Society, that believed wearing suits and ties with women in dresses was what needed to push the fight forward, Vice Squad Deputy Seymour Pine played by Matt Craven, Ron Perlman playing Ed Murphy, who ran the bar for the Mafia and pimped out some of the patrons, are just some of the actors who give excellent support to the film. The direction by Roland Emmerich does a serviceable job though he includes a few unnecessary scenes in the screenplay written by Jon Robin Baitz along with too many clichés that have the film running a bit over 2 hours though it does hold your interest and the riot scenes elicit many emotions. This is a much more important and more meaningful film than “Brokeback Mountain” was and I hope it crosses over to the crowd that went to see that movie! PS I was living in New York City at the time and will write a second piece talking about my reactions, what I saw and what I didn’t see and what I was doing that night and the following week.